Lindsay Wong grew up in a beautiful house in a wealthy suburb of Vancouver, in a neighbourhood whose moneyed façade belied the many grow ops and meth labs that dotted the mountainous foothills northeast of the city. It also did much to hide the fact that Wong’s apparently successful immigrant family, which contained engineers, and entrepreneurs, had a deep history of mental illness and abusive behaviour which they coped with in unusual ways. Displaying weakness or emotion, or being alone for too long, was a sure way to be possessed by an angry ghost or demon, and go “woo-woo,” the family euphemism for mental illness caused by possession. 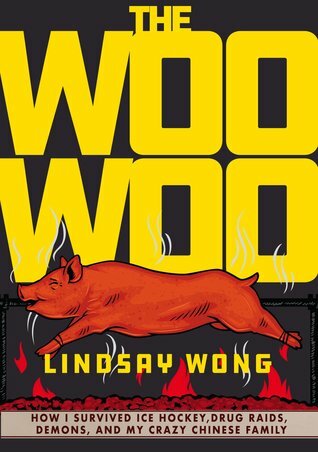 The Woo-Woo describes Wong’s unconventional and deeply disturbing childhood coping with her mother’s mental breakdowns, her father’s emotional distance and abusive verbal tirades, and her extended family’s general denial of healthy emotional expression or the existence of mental illness. Wong has a rather lurid talent for description, which she applies liberally to herself and her relatives. Trying to explain the supernatural beliefs that were used to dismiss the family history of mental illness, she writes, “Our family insisted that supernatural outcasts chartered our bodies because we were born with watery minds and squishy hearts, which meant that anything dead could rent us for free.” Rarely content with a simple account, many of her descriptions are viscerally grotesque in this way. Because a history of mental illness is prevalent on the maternal side of the family, she writes that her mother’s “DNA was made from small and faulty atomic bombs,” and many other evocative ways of describing just how wrong things were in her childhood home. But while I was willing to grant Wong license to describe herself and her family however she liked as she worked through her traumatic childhood, I recoiled in horror at the way she applied this talent others, such as a disabled high school classmate with whom she is forced to form a sort of parasitic friendship. She describes the classmate as follows: “If Wobin’s boxy torso was a tree trunk, her arms were branches. And her poor fingers were practically lobster claws, clenched together in fleshy baseball mitts—she was a cruel caricature of Frosty the Snowwoman.” This entire section churned my stomach, and I was practically incandescent with rage when I learned that after assigning Wong to accompany this classmate as an exercise in empathy building, her school also gave her the duty of changing the girl’s sanitary pads. The whole premise of using a person with a disability as an object lesson was bad enough, but then to have her privacy so intimately violated by a classmate who had shown little capacity for empathy? I honestly wanted to quit right there and throw this book out the window. Dark humour is a coping mechanism that in some cases allows Wong to side step a deeper examination of her history, and her own behaviour. The Woo-Woo was defended on Canada Reads 2019 by fashion stylist Joe Zee, whose opening arguments focused on the necessity of talking openly about the things that make us uncomfortable, and combating mental health stigma. He championed author Lindsay Wong as an intersectional voice—a young Asian woman from a difficult background. Several of his fellow panelists admitted to finding The Woo-Woo a hard read, for many of the reasons I described above. Zee made eloquent rebuttals, arguing that Wong’s narrative choices allowed the reader to feel some small measure of the horror she was living every day. Each book received one question on the fast first day of the debates, and the discussion of The Woo-Woo was based on a question about the book’s effectiveness in opening the reader’s eyes to cultures and experiences unlike their own. Yanic Truesdale—defender of Suzanne—spoke to the difficulty he had connecting with the people portrayed in the book, and finding his way into the narrative. Ziya Tong—defender of By Chance Alone—voiced concerns as a half-Asian woman herself that the book would reinforce some negative stereotypes that already exist about Chinese-Canadians. Joe Zee countered that while stereotypes are simplistic, the people portrayed in The Woo-Woo are nuanced and complex. Chuck Comeau—defender of Homes—described the book as being a tough read, but also an eye opener that effectively engendered sympathy. Lisa Ray—defender of Brother—did not have a chance to speak to this question, but in the Q&A after the debates, she expressed that she didn’t see an arc of growth or development, but rather a series of anecdotes. When it came time to vote, Joe Zee cast his ballot against Suzanne, while Ziya Tong voted against Homes. Lisa Ray, Yanic Truesdale, and Chuck Comeau voted together, making The Woo-Woo the first book eliminated from Canada Reads 2019. The first day of debates always goes by extremely quickly, with each book only being briefly touched on, and one of Zee’s best moments as a defender actually came in the Q&A after the show, when he spoke powerfully about the language we use to discuss mental illness. While “that’s so gay” has been widely recognized as a harmful turn of phrase that stigmatizes a minority group, “that’s so crazy” is still a common colloquial fixture of our language. Indeed the word had been used quite casually by the other panelists during the debate. Despite the early elimination, Zee was an eloquent defender, and could prove to be a persuasive force as this year’s first free agent in the ongoing debates. This sounds incredibly dark and horrifying and I will definitely not be reading it, but I really enjoyed your summary. Recently, within the last year I think, I’ve started trying to replace ‘that’s so crazy’ with ‘that’s wild’ or ‘how strange’ in my own vocabulary and I agree with Zee that language surrounding mental illness is often casually misused. Regardless, I don’t think this book is for me!